Our community’s rich history seems apparent everywhere. Look in any of our metro Quad-City towns and find abundant evidence of 100-plus-year-old buildings, businesses and homes. So when change runs headlong into preservation, sparks sometimes fly. That leads to headlines on stories about historic preservation as a problem to be managed, or an obstacle to overcome. Then along comes a Colorado couple who view our community’s history as an opportunity, not a conflict. Maurice and Lois Woods are purchasing three Gold Coast homes and intend to put their rehab experience and skills to work in the Quad-Cities. Davenport’s history captured the Woods’ interest years ago on a cross-country tour. Now in retirement, they’re leaving Colorado for a new adventure in our historic community. Among the homes they’re rehabbing is 604 Gaines St. Anyone traveling on Gaines can’t miss this relic. It’s stately tower and curved windows overlooking the river offer a hint of the city’s past glory. The dilapidated siding and broken windows tell a sadder contemporary tale. The Woods’ enthusiasm is shared by many Quad-Citians and the couple was fortunate to meet some of them in Davenport’s Gold Coast neighborhood, including Jack Haberman. “Jack has introduced us to the nicest group of people I have ever met in my life,” Maurice Woods told Times reporter Alma Gaul. Haberman founded the Gateway Redevelopment Group, which is loaded with ardent preservationists who exhibit the joy of preservation. Their dreams of restoring Davenport’s history inspired the Woods to follow their own dream. That’s how dreams can work. We welcome the Woods to the Quad-Cities’ inspiring preservation community whose work assures a future for our celebrated past. If you’re headed to the Gold Coast for next weekend’s home tour, do not miss taking a look at the house on the northwest corner of 6th and Gaines. Less than two months ago, this large home was sitting empty, forlorn and peeling … as it had for years. Today it is painted a seven-color scheme of grays, pink, blue and cream and awaiting some 50-60 new or restored windows that should be in by the end of September. The transformation is thanks to Maurice and Lois Woods, a Colorado couple who have been serendipitously smitten with Davenport’s Gold Coast to the point they have bought and are fixing up three homes in the area, and they are planning to make it their home. The quick turnaround on the house at 604 Gaines has amazed a lot of people, Woods says, but he had no doubt it could be done. All it required was hard work and know-how, and after a lifetime of rehabbing homes, Woods was up to both. The project took 21 days, including four to put up and take down the scaffolding, he says. 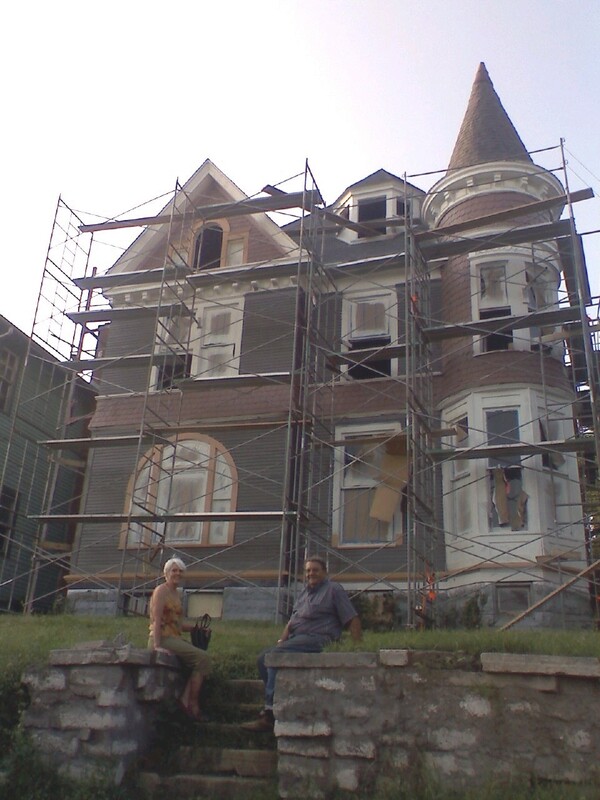 The work consisted of scraping away the peeling paint with carbide blades, replacing rotten boards with some 3,000 feet of new cedar, filling holes with some 150 tubes of caulk and applying 50-60 gallons of penetrating, oil-based primer before the finish colors. Woods’ next jobs after the windows will be to rebuild the stone steps on the Gaines Street side of the house and the retaining wall in the yard. Then the couple can spend the winter fixing up the inside. “We’re pretty excited about it,” he says. Alma Gaul can be contacted at (563) 383-2324 or agaul@qctimes.com. Comment on this column at qctimes.com.